Recently I re-watched Tiny Furniture. I identified with this film so hugely when I first saw it, particularly the dynamic between the mother and sisters. I’ve been watching Girls, Lena Dunham’s HBO follow-up and wondering why it didn’t grab me the way this movie had. A re-watch was in order. I found one scene particularly poetic. A chef and the main character are smoking pot and talking about kohlrabi. Which made me howl because I happened to have a monstrous one sitting in my fridge. The chef insisted it wasn’t real food just a made-up vegetable chopped and pureed to look fancy which made me howl some more. Isn’t kohlrabi one of those root purees like parsnip or celery root purely put on this earth to hold up a piece of meat? To add more “je ne sais quoi” than say mashed potatoes? I received this monster from Horse and Buggy Produce, who continue to stretch my brainstorming abilities with each passing week’s offering of CSA veguhtaybles. When stumped, who better to ask than all you surfers out there in social media land? 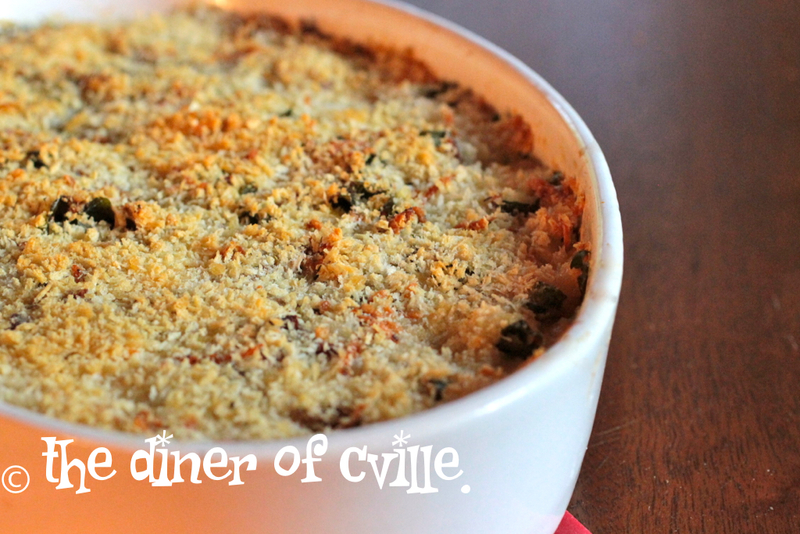 Answers like “roast” or “grill” or “salad-ize” appeared, but the one that got me was “gratin”. Mmmmmmm, nothing better than a hot creamy cheesy mess to line your stomach with on a Sunday night and add comfort to the penultimate episode of this season’s Mad Men. Gratin it shall be. Kohlrabi looks like a cross between fennel and cabbage. One big bulb, but instead of delicate fronds, you get tough ol’ turnip-y leaves attached. Chop these off and chiffonade. Peel the tough outer layer of the bulb. I ate a raw slice of the stuff and it didn’t taste like anything. Not parsnip, not jicama, not anything. Just bland crunch with a slight potato-ey aftertaste. Layer thin slices of the bulb with the chopped leaves, thin slices of white onion, crispy bacon, and shredded parmesan. Pour on enough heavy cream to fill the gratin dish and top with dried thyme, crushed red pepper, panko crumbs, and a drizzle of the bacon fat for good measure. Cook at 375 degrees for an hour or until bubbly and browned on top. It turned out great, although my sauce was a tad thin, and some of the slices were still too firm. They may have softened up by tonight’s leftovers. Next time I’ll probably cook it at 400 and see what happens. The greens add a nice dark woodsy taste and of course the bacon and cheese add a lot. And the kohlrabi? It tastes like potatoes. Just like potatoes, but without the satisfying mouthfeel you get from a good mash. I understand kohlrabi has way more fiber and antioxidants. Still. It’s kind of like mashed cauliflower, no matter how much butter and salt you put on it, it’s still, mashed cauliflower. Thanks to Kathy Kildea for the recipe and to all my Facebook likers for their helpful suggestions. And Horse and Buggy for the challenge. One thing about kohlrabi, it’s so huge, takes up so much real estate in the fridge, when you get one you definitely want to eat it right away. And in the end, that chef might be right. It was pretty tasty, but I don’t think it’s going to take the place of potatoes in my stomach anytime soon. Lovely devilish carbs. Kohlrabi fries? Um, yeah, no. I’ll take my curly ones thanks.